I know it’s been a while. Have you ever lost your way for a time? Well that’s what happened with me. There are still challenges of course but I am coming to terms with them and finding solutions. The best thing for me is to write and so let me share about our journey to Juneau to get the mutts and bring them back home. Most of our crew was in Juneau for the summer giving dogsled rides on the glacier and on the ground to tourists off the cruise ships. It’s a wonderful way to introduce people to the sport and to keep the dogs busy all summer. Last year I was down there with the dogs and enjoyed a mostly sunny summer in Alaska’s capital which is pretty unusual weather wise. Let’s just say I am glad I didn’t go this year. It rained and rained and rained. Almost every day. Ugh. This is the ground operation the dogs and I were at last year – when it was mostly sunny! After four months away it was time to bring our dogs home. Darrel and I flew down because we had left the down truck in the company parking lot all summer. Have I mentioned I hate flying? The plane was packed – hot – dry. My favorite part was when the captain said we should snug up our seat belts because they were expecting heavy turbulence coming into Juneau. And by favorite I mean not really. We got to the hotel room about 10 p.m. – all wound up of course and unable to sleep right away. After a couple glasses of wine and a snack we drifted off about midnight. We were supposed to be ready to start receiving dogs off the glacier at 7 a.m. I woke up early and well, the clouds were practically on the ground, so there would be no early chopper flights for the dogs. About 10 a.m. we got a text from the helicopter base that the choppers were firing up and could we head over to the base? Yup. Woo hoo, our dogs were going to come down from the glacier! We drove over to the base just as the weather window slammed shut and and the choppers turned off their engines. Sigh. It started to rain and then blow pretty good. We did get the six dogs who had been working with our dear friend Shaynee for the summer in the ground operation. They looked great and it was so good to see them again. Since the choppers weren’t going anywhere, breakfast and coffee was in order. Then we hung around the base again. And waited. Drank coffee. And waited. Around noon there was the tiniest of weather windows for the choppers to get through and they were off. In a matter of minutes they returned with our dogs. Alaska Icefield Expeditions has organized the transfer of dogs from chopper to ground like a dance and after a quick burst of activity we had all but two of our dogs. Pee Pee and Hiccup were still hanging out on the snow. And yes, you guessed it, the clouds rolled in again. We have some dogs that look almost identical except for slight color variations. After a summer on the glacier their coats lightened to the point where I had trouble telling who was who! The red dogs were almost blonde. Anyway, as the afternoon rolled on, we began to have to figure out what we were going to do if Pee Pee and Hiccup didn’t get off the glacier. 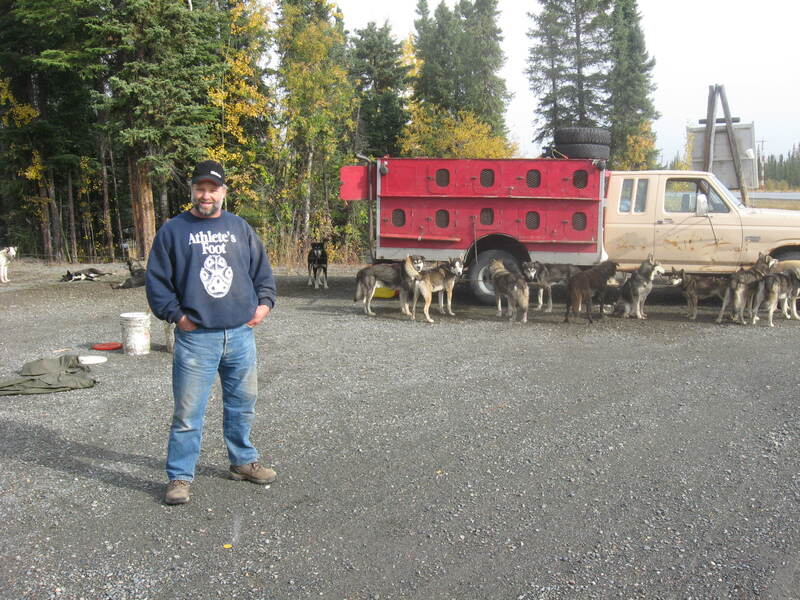 There was talk of staying an extra day or having another musher deliver them to Tok, about 5 hours from our place, on their way home. At the last minute, about 6 p.m., the choppers flew and got our two plus another group back on the ground. During the 6 hour wait we drove back and forth from the crew quarters to the chopper base, organized the truck, read, shopped for snacks and chased a loose dog around in the pouring rain for an hour. Sasha is one of ours and she loves to play catch me if you can. Nick, who worked with her all summer has adopted her, and he had her in the crew quarters. Well someone left a door open and Sasha bolted. Poor Nick looked like a drowned rat by the end but he still loves her so it was all good. After getting all the dogs we headed over to the ferry terminal to drop dogs and give them a snack and a bathroom break. It was pouring rain of course and blowing about 30 mph. After about 5 minutes most dogs, who had been warm and dry in their boxes, had had enough and we trying to climb back in. We went through the routine again about 10 p.m. and the dogs were just as disgusted. Then Darrel and I settled in for a cold, damp nap in the truck. At one point he made the astute observation that “we are getting way too old for this crap.” The alarm went off at 4 a.m. and we dropped dogs again. And yes it was raining. 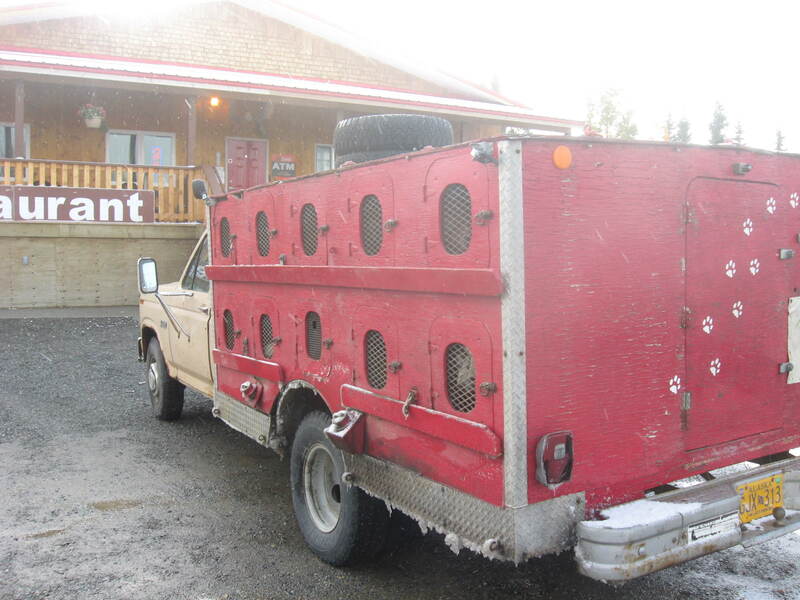 Despite their obvious disdain for the weather, we left the mutts out for a bit because we were getting on the ferry at 6 and they would be on the truck for about six hours – or so we thought. We boarded the ferry and left the dock. And then returned to the dock. And left the dock. And returned to the dock. Apparently one of the engines wasn’t working. And apparently it hadn’t been working when they had come into Juneau. Why they boarded all of us is a mystery because I don’t think something like that is magically fixed when they get to a dock but then again I am not a marine mechanic. We spent the next seven hours mostly going around in circles in the harbor while they tried to fix the engine. At one point the ferry docked and an announcement was made that pet owners could get off the boat and take their dogs for a walk in the parking lot. 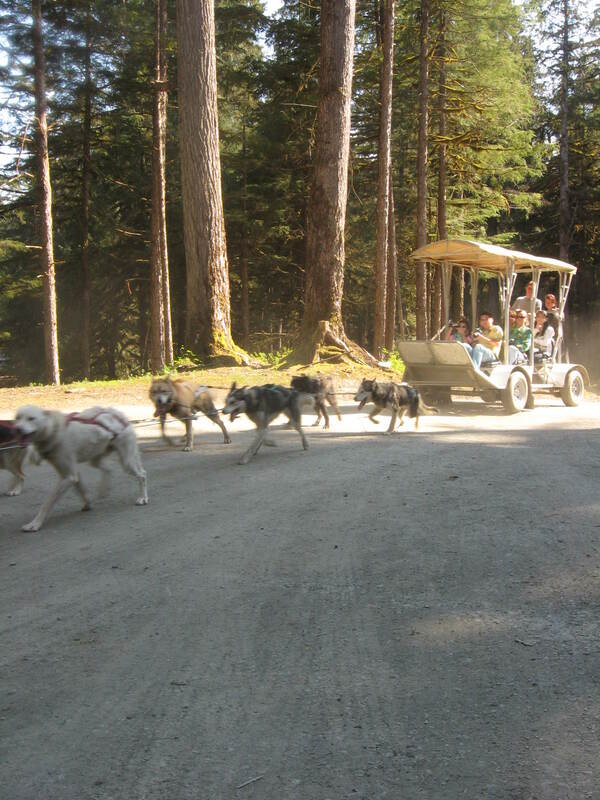 It took quite a bit to make the purser understand that we couldn’t just take 26 sled dogs for a walk! Finally they handed us garbage bags and a huge roll of paper towel and let us use our drop system on the car deck and we got all the dogs out for a bathroom break. And right after that we were underway in a straight line! After getting off the ferry in Haines, 7 hours behind scheduled, we figured we’d just buy some food at the store and get on the road. We stopped a local and asked what store was open. He said and I quote, “Nothing is open this time of night.” Now I would like to point out that it was 7 o’clock in the evening. Good grief! So we ordered some sandwiches and salad at the bar, which of course was open, and headed for our favorite drop spot just before the Canadian border. And then there was the rock slide on the highway. Darrel and a transportation worker used shovels and muscle to clear the road while I spotted for further slides. And yes of course it was raining. And dark. And did I mention that I don’t see real well in the dark? We were underway again after about an hour and finally dropped dogs. The sky cleared and it was a beautiful night. And I discovered that the poop bucket just isn’t for dog waste. Hey, when you have to go, you have to go! The dogs were finally enthusiastic about being on the ground and rolled and kicked dirt all over the place. Except for Scoot. I don’t know what he was daydreaming about but he was all hunched up, with what looked like a painful erection. He looked pitiful. Darrel and I argued about who was going to help him. I figured since Darrel was a boy it was his department. He thought since I had worked in a vet clinic it was my area of expertise. Poor Scoot. I really didn’t know what was going on. He was dribbling urine and I thought maybe he was trying to pass a stone. But we had girls coming into heat so maybe he was overexcited. And then I thought about the shrinkage factor. Yes, gentlemen, I took a handful of cold water and splashed it on his, er, exposed part. He was not happy but his parts immediately returned to normal and he became his usual, happy self. Lucy enjoying laying on the dirt after a summer of snow. We had to get to the border before it closed at 11 p.m. Alaska time so we were underway again in plenty of time. We pulled up to the Canadian border agent and Darrel opened the door which of course immediately made her suspicious. I figured it wouldn’t do any good to explain that if we tried to roll the window down it would fall out at her feet. She began to bang on the inside of the door and was satisfied we weren’t running drugs. Then she asked how many dogs we had per box. And how often we let them out. Oh, oh, pet lover alert. We explained that they were all pretty much single except for the 4 foot deep boxes where there were two. And we let them out every 4 to 6 hours. And they were out for 45 minutes to an hour. She seemed to be very happy with that, checked our paperwork and wished us a safe journey. Now there is nothing wrong with being a pet lover. We have pets. 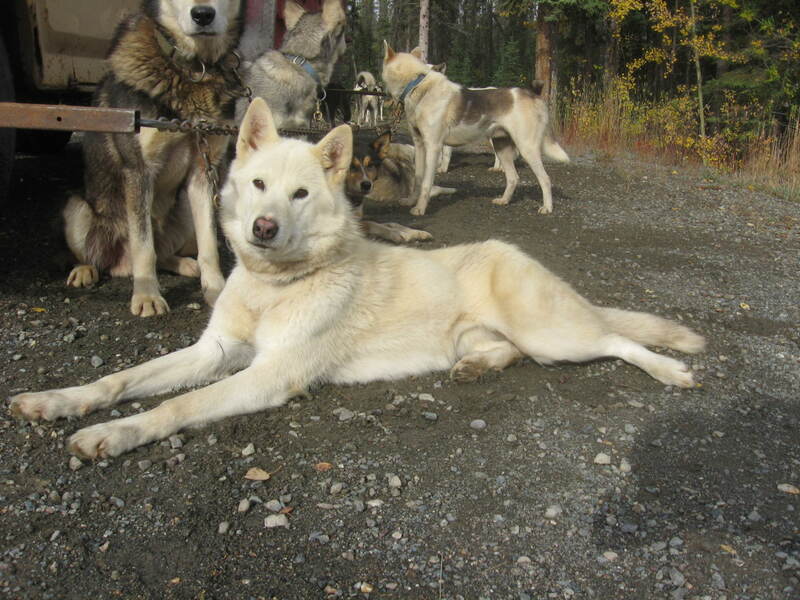 And frankly we consider our sled dogs pets. But they are also working animals. We take exceptional care of them and I would argue we often know more about our dogs than most people do about their pets. We know how many calories they eat each day, what ingredients are in their food, how much water they drink, what their poop and pee looks like, what shape their teeth are in, who they like and who they don’t and the sound of their individual barks and howls. That doesn’t make us better. We just need to be that in tune if we are to be caretakers of our dogs. The next part of the drive, until Haines Junction, was pretty good. We stopped for fuel and then saw it. The flat tire. On the inside dually. Sigh. We drove to the top of a hill where we knew there was a pullout and changed the tire. Let me add that the wind was howling and it was beginning to snow. Oh yes and it was about 1 a.m. Then we were off again. What we didn’t know is that we were about to drive through the mother of all snowstorms. Apparently there was a storm warning for 10 inches of snow, whiteouts and high wind. See the snow and ice on the bottom of the truck? This was after it had started to warm up! Darrel didn’t get the truck past 20 mph for a long, long time. There were no tracks and so he really couldn’t tell if we were on the road or not. At one point we drove out of it – or so we thought. Finally we made it to Beaver Creek and settled in for a refreshing 3 hour nap. We woke up to a couple of inches of new snow on the ground and an urgent need for coffee. After buying 2 of the largest coffees each we could find we dropped the dogs in a pullout where we had once dropped the transmission in the dog truck. We have such fond and romantic memories! Darrel at the Beaver Creek dog drop. I had to spread my rain gear on the ground to dry it out. By then the sun had come out and the ground was drying up. A few tourists pulled up and took pictures and talked with us. Even though we were practically incoherent with lack of sleep they seemed to enjoy our company! We headed for the U.S. border which, honestly, we usually don’t look forward too. The Canadians are usually nicer. Yeah I know, that sounds like a stereotype, but it’s true. 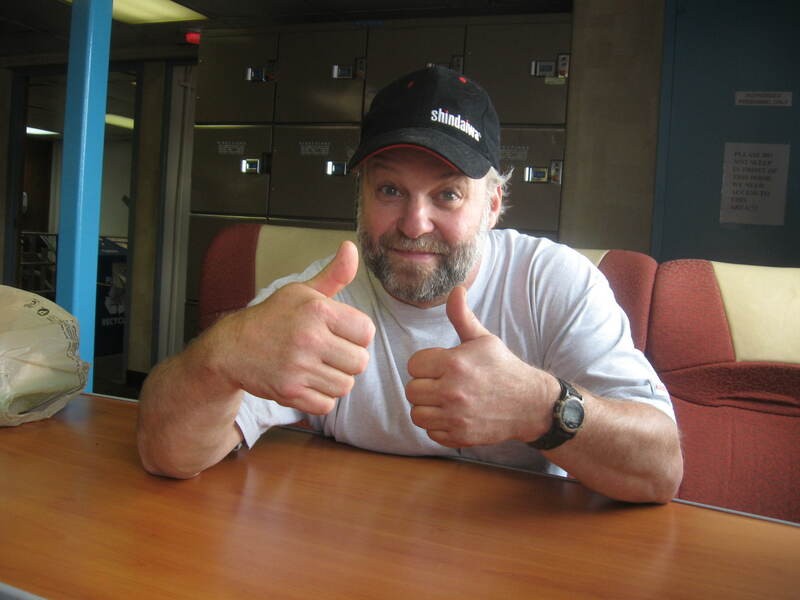 The Canadians have been very thorough at times but have always been polite and professional. On the U.S. side we usually run into grumpy border guards who really don’t seem to like their jobs. Except for this time. The woman who manned the post when we crossed was a pleasure to deal with. She checked our paper work and asked us a bunch of questions. Then she checked the dogs’ paperwork, looked in the boxes and wait for it, said, “Welcome home!” That felt good. We stopped at Border City Lodge, which is a place to get fuel, coffee, a meal and a bed. The guy who runs it should be a border guard. He re-defines surly. Darrel asked him if the highway was busy with tourists and he replied “Well you should know, you’re the one on it.” Hmmm, ok. Butthead. Then some guy came in and asked if he should pump gas first and then pay to which this ambassador of good will replied, “Well that’s what the sign on the door says.” Okay, moving right along. 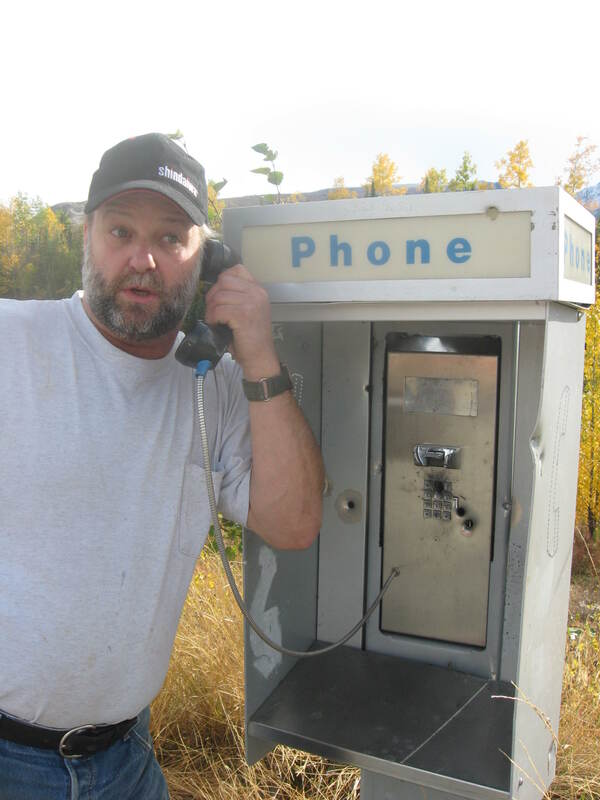 A phone in the middle of nowhere. Do you see the bullet holes? We made it to Tok and had a quick bite to eat at Fast Eddys….the only place to eat in town I might add. Then finally made it home. Of course that’s when the real work began because we had to walk 26 dogs from the driveway to their spots in the dog yard. After an hour everyone was in their spot digging, running, pooping, howling. And the neighbors were oh so glad that we were home! This entry was posted in Uncategorized and tagged Alaska, alaska rain, border crossing, dog truck, huskies, juneau. Bookmark the permalink.